The number of unemployed in the sector has recently increased. Rising numbers of Russian pilots are searching abroad for work, as financial and political circumstances contribute to airline bankruptcies, and a rise in unemployment. The move threatens the ailing sector with the potential loss of some of its most experienced fliers. With domestic carriers struggling to cope with tough new economic realities and the suspension of flights to destinations like Ukraine and Turkey, Russia’s commercial pilots are feeling the pinch. The number of those unemployed has doubled to 4,000 over the past year, while salaries have started falling. With little sign of better times on the horizon and the possibility that several airlines may have to abandon the market, more and more pilots are now searching for work abroad. According to Miroslav Boichuk, president of the Pilots’ Union, there are about 14,800 pilots in Russia who are licensed to transport passengers in commercial airlines. The number of those unemployed in the sector has recently increased. There were 1,500 to 2,000 unemployed pilots two years ago while today there are between 1,600 and 4,000. Around 500 of them are pilots from Transaero, Russia’s second-largest airline, which stopped flying in October 2015 due to financial difficulties. Before filing for bankruptcy, Transaero had about 900 pilots. "About 150 pilots went to Aeroflot [Russia's largest airline]. About 50 people found jobs with other companies and another 70, who used to fly Boeing 747s, are now working for AirBridge Cargo," said Boichuk. Another group of those Transaero pilots have interviewed at a new company, ‘Rossiya’, being created from a merger of three Aeroflot subsidiaries: Rossiya, Orenburgskiye Avialinii and Donavia. A Gazeta.ru newspaper source close to Aeroflot remarked that the airline currently had 26 vacancies for aircraft captains, while in 2013, for example, Aeroflot needed 140 captains. It is not only the number of available jobs that is falling. The salary for captains has also been reduced. Two years ago, an Aeroflot aircraft captain could earn 500,000 rubles a month ($13,000-14,000, according to the 2014 exchange rate). Now, according to Aeroflot vacancy advertisements, the maximum salary a captain can earn is 400,000 rubles ($5,000, according to the Feb. 1, 2016 exchange rate). "Back then there was a lack of aircraft captains for certain types of planes: the Airbus 319, the Airbus 320, the Airbus 321, the Boeing 737," said Boichuk. He added that two years ago about 3,000 people out of the 7,500 co-pilots had more than 2,500 hours of flying experience, which gave them the right to apply for the position of captain. Many pilots have responded to the lack of domestic opportunities by searching for employment abroad. 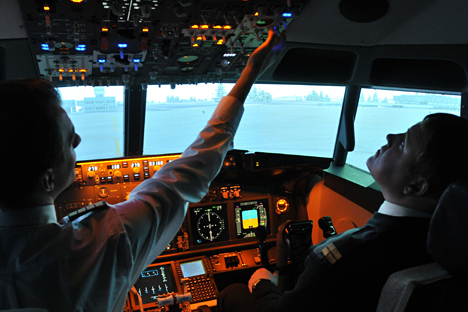 The Pilots’ Union has calculated that, since the end of 2014, about 50 pilots have obtained work in other countries. A year ago, the daily broadsheet Izvestiya wrote that 264 Russian pilots were employed by the Emirates airline. "There is demand for our pilots abroad. For example, China, according to various sources, needs 300 experienced captains. But China has strict medical regulations. The selection process is rather severe. During a recent selection, out of 20 Russian pilots only two were picked. Unfortunately, the cream of the crop, our best specialists, are leaving Russia," said Boichuk.